The IGP says so far no police report on the article has been lodged. PETALING JAYA: The police are monitoring a blog named steadyaku47 after it posted an article criticising the Selangor Sultan. 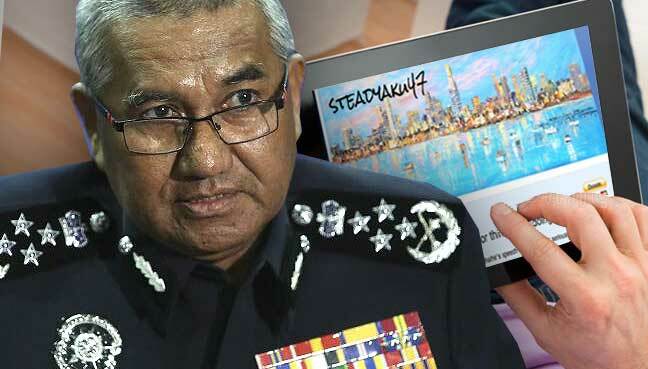 “It has caused uneasiness among the public,” Inspector General of Police (IGP) Mohamad Fuzi Harun told FMT when asked about the contents of the blog. The IGP added that so far no police report on the article has been lodged. The sultan recently hit the headlines after he described Pakatan Harapan chairman Dr Mahathir Mohamad as a man driven by hate and that his anger would “burn the country”, in an interview published in The Star to mark his 72nd birthday. Earlier, the ruler was enraged by a remark by Mahathir that Prime Minister Najib Razak could have descended from a Bugis pirate. The former premier said it while addressing an anti-kleptocracy rally at Padang Timur here on Oct 14. Sultan Sharafuddin, whose forefathers were of Bugis lineage, said Mahathir’s remark would incite the people to negatively perceive the Bugis. Here we go again…IGP has got nothing better to do? Crime in Malaysia is no longer a worry? What about prostitution? No longer a source of income for PDRM? Fuzi wants to check my background? No need lah…let me help him. I live in Australia and have been here for a hell of a long time. Not been back to K Hell for almost a decade. My late father, Hamid Latiff, was formally Director CID under Tun Haniff….at a time when I think this Fuzi belum bersunat lagi….sometime in the early 70s. As for me causing “uneasiness among the public”….I think you need to have your head examined! Are you stupid or what? I am a 70 year old man, on a pension, living over 3000 kms away from K Hell! What kind of “uneasiness” can I cause the Malaysian public? The only uneasiness I can possibly cause is to Idris aka Sultan Selangor….and that too only if he has something to hide from his subjects in Selangor. His sexual orientations perhaps? I don’t know for sure….you better ask him yourself what his sexual orientations are…..and kalau normal….nothing to worry about ma! But, kalau abnormal and against the norms of Islam…you better arrest him…not me! As for waiting for a police report to be made…come on lah! Don’t make me laugh lah….if the powers that be wants a police report to be made it would already have been made yesterday even though my posting was only posted today! By the way Fuzi…what were you doing in Sydney with that Chinese Multi Millionaire just a few days before you were appointed IGP? Care to share with us your side of the story? Ini yang aku marah…all the dedak being distributed and corrupt politicians all around him and this IGP wants to kachau me…a 70 year old man living on a pension who is very upset because this Idris guy living in the Istana in Shah Alam go and kachau another old man who is older then me….the 92 year old Tun. Fuzi go play marbles with your balls if you have too much free time. Have not met anyone so far feeling uneasy after reading the article; in fact they were quite amused! Igp, can you please talk in a language that is understandable to all. To me, what you just said, made no sense, as first you claimed uneasiness caused, which you later conflict it by no police report. IGP, IS IT NOT THAT EVERYTHING IS OK AND PEOPLE ARE AT EASE, WHEN THERE IS NO POLICE REPORT? Well at maybe you should file one in that case. Not many people know there is a blog known as steadyaku. But now everyone know.